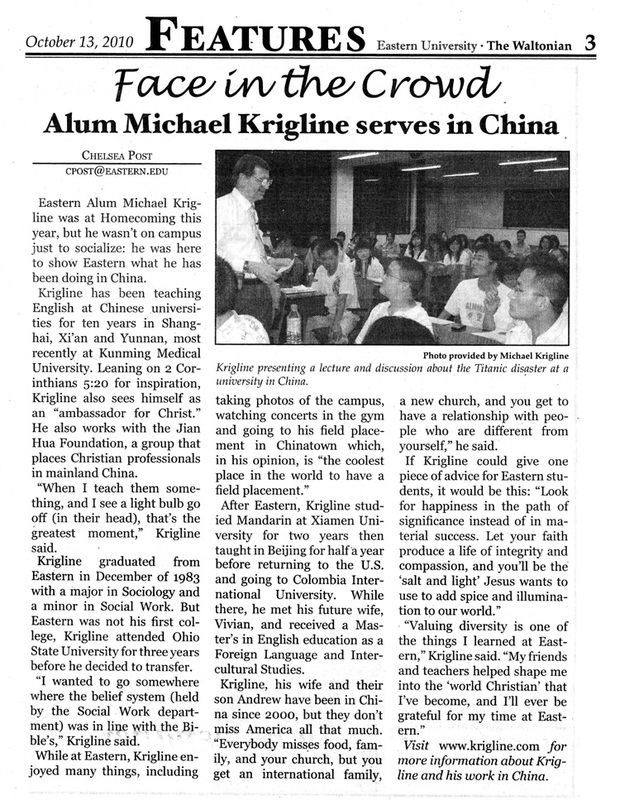 In October 2010, Michael visited his alma mater: Eastern University (see the "vocabulary" at the bottom if you don't know what "alma mater" means). While there, the university newspaper interviewed him for this feature. Find Eastern's Newspaper by clicking here. alum (slang): technically, "alumnus" is the singular form of "alumni," but this writer used the abbreviation "alum." I really liked what the writer wrote about our interview, though some things need to be clarified or corrected. I returned to Eastern to enjoy the alumni reunion, but since my colleagues in China are always asking me to find "more teachers like you" I was also hoping to recruit new teachers willing to work in China (so I had photos on display, and handed out information about JHF). Anyone who knows me knows that I take my teaching job very seriously, and that I am also serious about my relationship with Jesus (this article may not show that balance as much as I'd like). I don't exactly "work with" the Jian Hua Foundation (JHF), though I'm proud to be a JHF "associate." JHF helps professionals from around the world find jobs in China where their skills can make a difference; their motto is "Serving the communities of China with hope and love." JHF donors also help make up the difference between China's low salaries and high costs for foreign workers (by helping with insurance costs, travel expenses, Andrew's expensive school fees, etc.). I earned my BA (major: Sociology; minor: Social Work) from Eastern College in 1983. I earned an MA (majors: Teaching English as a Foreign Language and Intercultural Studies) from Columbia International University in 1999. The Bible verse mentioned above says that ALL Christians are Christ's ambassadors: "20Now then, we are ambassadors for Christ, as though God were pleading through us: we implore you on Christ’s behalf, be reconciled to God. 21For He [God the Father] made Him [Jesus] who knew no sin to be sin for us, that we might become the righteousness of God in Him." 2 Corinthians 5:20-21, The Bible, New King James Version, 1982 [i.e., re-translated from the original Greek in 1982].